The spacecraft is set to bring seismic science back to the Red Planet when it arrives this month. N	N	ASA will be celebrating the 50th anniversary of space seismology on Mars. 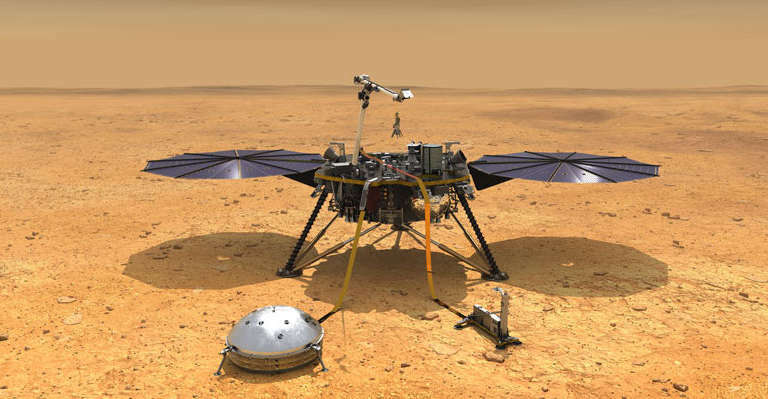 Provided that the InSight lander arrives on the Red Planet safely on Nov. 26, it should be awake and operating a seismometer in time for July 20, 2069. That’s the anniversary of Apollo 11, the first human moon landing. Apollo 11 also carried a seismometer — the first ever deployed off the Earth. The seismometer only worked for three weeks, but it was a good testbed for the other seismometers that were deployed on Apollos 12, 14, 15, and 16. Data was transmitted to Earth until September 1977, according to the Lunar and Planetary Science Institute. These seismometers showed tiny moonquakes, with Richter scale magnitudes of less than 2. They also revealed the moon’s interior, and even the occasional meteorite hit on the surface. Later Apollo missions also deployed devices called heat flows, which measured how much heat is emanating underground from the core of the moon. At a recent press conference at NASA’s headquarters in Washington, D.C., InSight principal investigator Bruce Banerdt pulled up footage from the Apollo missions showing astronauts doing lunar geology. In one clip, Apollo 15 commander Dave Scott struggled to put a heat flow experiment underground. But there is a way to do it on Mars. A few months after landing, InSight will try to replicate the Apollo work without the benefit of astronauts. InSight has a robotic drill and hammer that can push the heat flow probe underground. Meanwhile, a robotic arm will deploy a six-seismometer suite on the surface. The hope is that, somehow, InSight detects a marsquake. The last seismometers on Mars did not function according to plan during the twin NASA Viking missions that touched down 1976. One lander’s seismometer broke upon landing, while the other was stuck on its lander high enough that the wind kept rattling it. Scientists learned about wind dynamics on the Red Planet, which is an interesting field in itself — but nothing about marsquakes. The existence of a marsquake implies that the planet is active. An active planet has a much better chance of life because life thrives off of a dynamic environment. Marsquakes also show the interior of the planet, because the arrival times of different types of seismic waves will help scientists learn about the composition of the core, mantle, and crust. But even if no marsquakes emerge, JPL’s Lori Glaze said that InSight will still provide valuable information about the interior of Mars. “We do have other instruments,” noted Glaze, the acting director of NASA’s planetary science division. “We’re certainly going to learn about the heat flow out of the mantle, and we’re still able to measure the size of the core,” she added. The core measurements will be done through a radio science experiment. Antennas on Earth will pick up InSight’s faint signal to see how much the planet underneath wobbles in its orbit. These wobbles will yield the size of the core. InSight’s landing site is Elysium Planitia, a quiet zone that will be very flat and, investigators hope, not too rocky to set down the seismometer. Landing on Mars will be tricky, and NASA is hoping to keep up its successful streak of Mars missions that has lasted since 2001. Even after InSight’s scheduled landing, both NASA and Europe have ambitious Mars missions planned in the 2020s. Each agency will send a rover to Mars to search for signs of habitability, building on the past work of the Spirit, Opportunity, and Curiosity missions. NASA’s Mars 2020 rover will even store the most promising samples for an eventual sample-return mission to Earth.